We wanted to create a space where imagination could live and breathe alongside practical teaching tools; where teachers could mirror their students’ experience and become learners themselves. Above all, we wanted to create a space where teachers could gather together as a community to share ideas, stretch themselves, and attempt to tackle the big question that educators everywhere are facing: How are we preparing students for our changing world? So with saws and paper, with some curriculum ideas and open minds, we opened the doors to the Exploration Center. And what have we learned along the way? 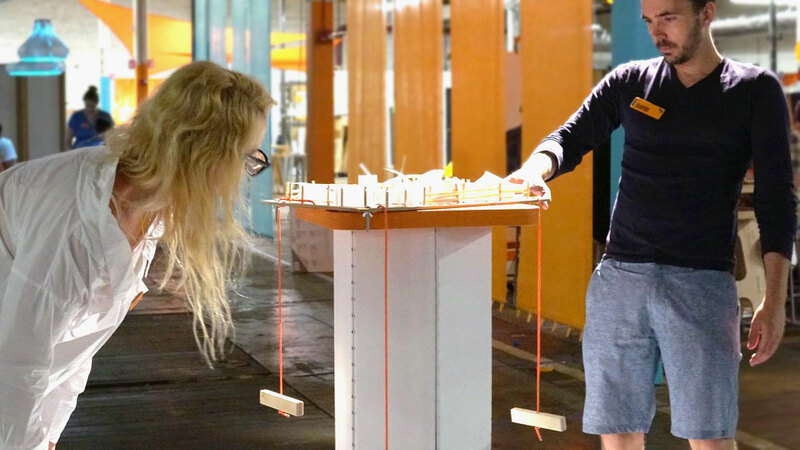 Critical making is so much more than just a set of creative tools tied only to science or engineering. It is an approach that universally transforms teachers into educators who facilitate engaging opportunities for creative making for their students — no matter what grade, subject, or school they teach in. 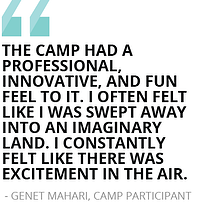 Genet Mahari, Owen Boynton, Kelley Huxtable, and Damien Altrui were all looking for a professional development experience that felt starkly different than those they had experienced in the past. “Mostly, I signed up because I desperately needed to interact with people who are more open-minded regarding curricula,” says Altrui, the Lead Crisis Interventionist at a New York City public school where he facilitates crisis intervention and peer mediation, and also provides students with a space where they can work on passion or skill-building projects. Exploring topics of balance and weight in relation to physics, participants are challenged to knock down dinosaurs before they destroy Pedestal City. Huxtable — a Tech Integrationist and Pre-K to Grade 3 teacher in the daVinci makerspace at the Inly School in Scituate, Mass. 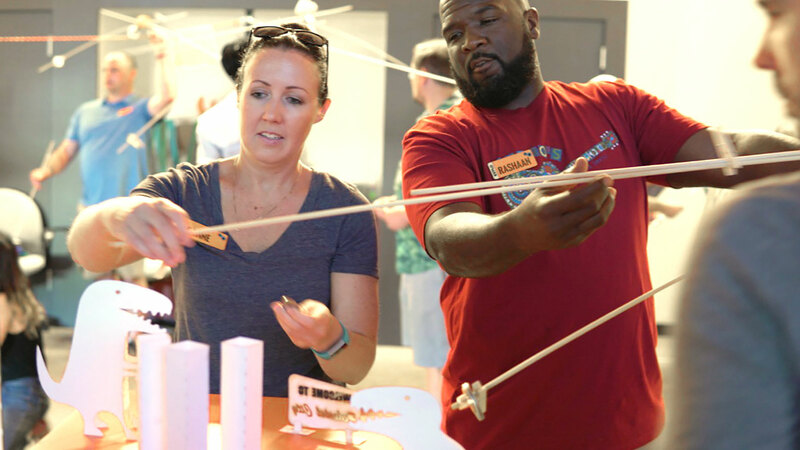 — and Mehari, a science specialist at the Curley K-8 School in Boston, similarly signed up for Critical Making Camp with the hopes of connecting with other educators who, like them, were interested in learning more about how to build curriculum that would bring critical making into the daily lives of their students. They found a common denominator in Altrui and Boynton: the desire to innovate. 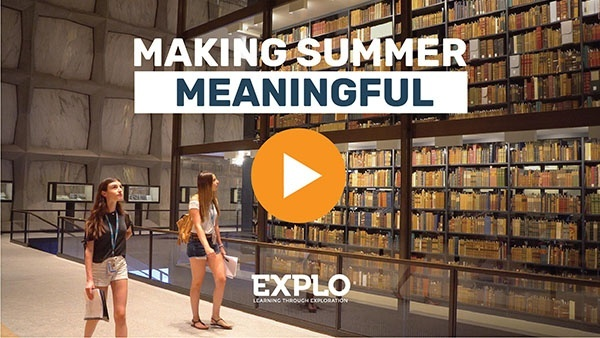 For more than 40 years, EXPLO has championed the power of hands-on, project-based learning for students attending our summer programs. As the leaders in this field, we knew we needed to create a professional development experience for teachers that embodies the same approach. Why? Because we all learn better when we’re absorbing new information as a result of the making and creating we are doing. 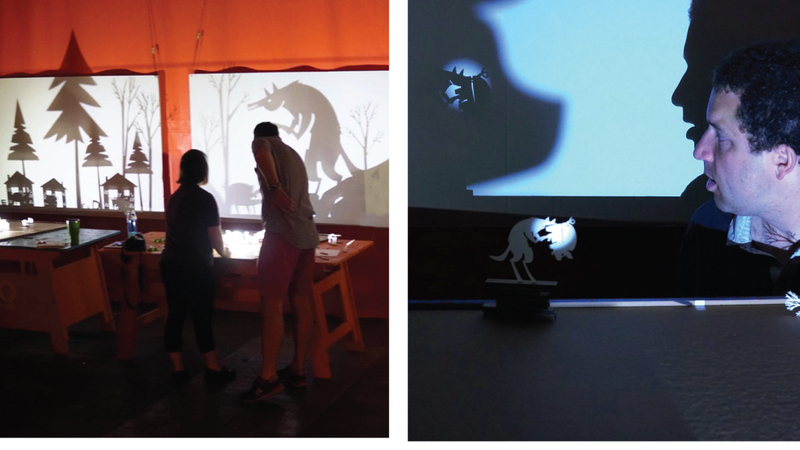 How do you project the story of The Three Little Pigs using just paper and flashlights? Participants navigate effective storytelling techniques. “The camp was exciting, stressful, challenging, eye-opening,” says Huxtable, reflecting on the atmosphere of her week at the camp. “You were living the curriculum. The experiences we had as learners played into how we could take the lessons and morph them into something that would work for our classes. 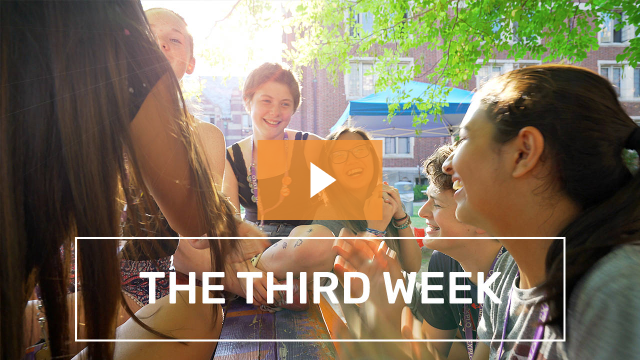 In many ways, what they experienced at camp is exactly the feeling that these teachers aim to instill in their own students — a sense of flow, which is the key to engaged learning according to the world’s leading researcher on positive psychology and EXPLO Advisor, Dr. Mihaly Csikszentmihalyi. 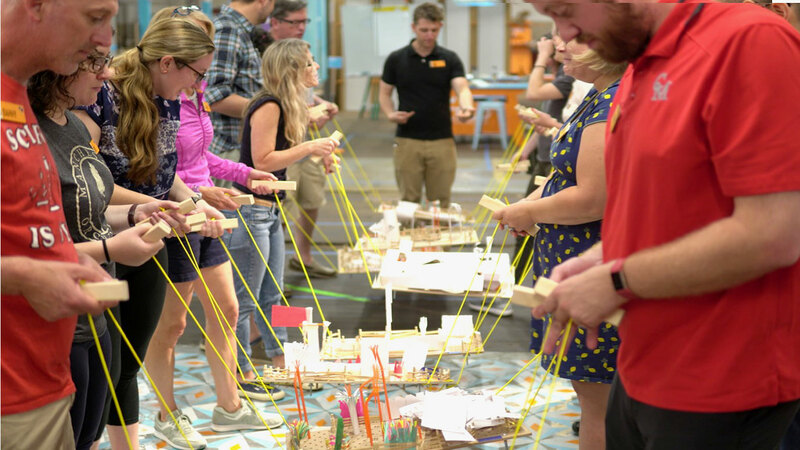 Collaborative teamwork, workshops that tie skill-building into theory, individual reflection, and open studio time are built into every day at Critical Making Camp for Educators. 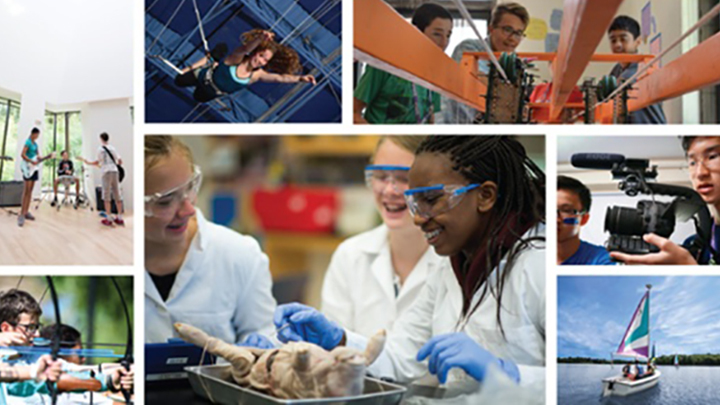 Collectively, these different pieces integrate pedagogy and practice, and inspire true engagement. 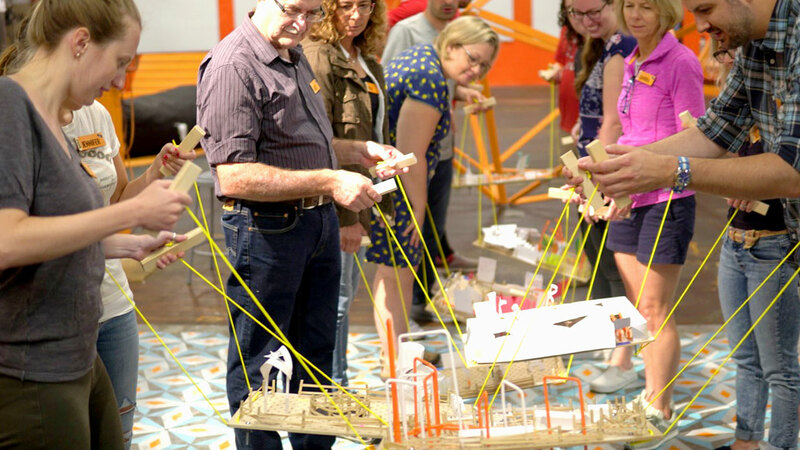 With the project “Maze Makers”, participants generate ideas on how to teach collaboration and interpretation via the development of sculptural narratives. Indeed, the act of making is at the very center of learning: making meaning of words, stories, histories, scientific discoveries, and mathematical equations — and then making our own creations, our own solutions, and our own stories. In this day and age, a teacher’s wish list for their school or the education system at large can feel daunting, at best. 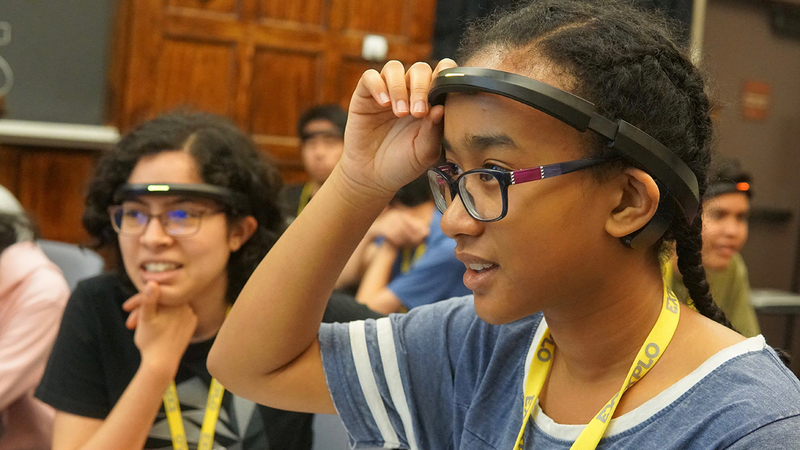 Mehari meditates on the possibility of creating schools where students could actually choose what they want to work on and delve deep into a topic. Participants learn about the power of presentation through their balanced Maze Makers projects. Altrui wonders at the interwoven complexities of student and family engagement in schools — the possibility that could come with making education a cultural activity (learning as “something you do beyond 3:00 p.m., in a specific building, with specific people”), and the importance of bringing shop class back to school. We find hope in the process of making, and in educators like Mehari, Huxtable, Altrui, Boynton, and the countless others who persist in their belief that transformative making can exist in every classroom — and in truth, that transformative making alters who we are as teachers, learners, and human beings for the better.